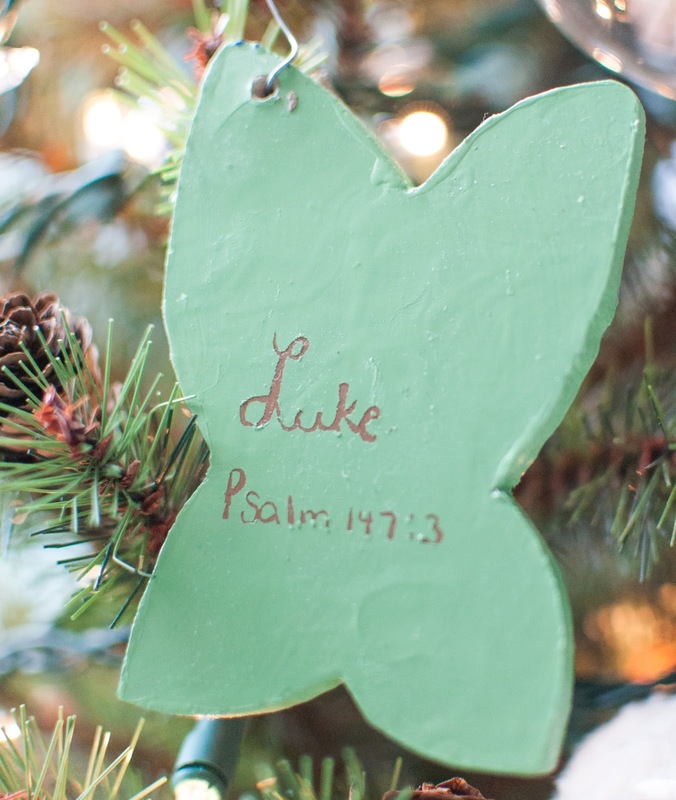 I know it's a couple weeks past Christmas, but I haven't gotten around to sharing Lily's and Luke's mini Christmas tree, along with their special ornaments until now...Ornaments are such a special and sweet way to honor and remember a missing baby at Christmas. It's a way to include that child during the holidays. I look forward to collecting many more through the years. 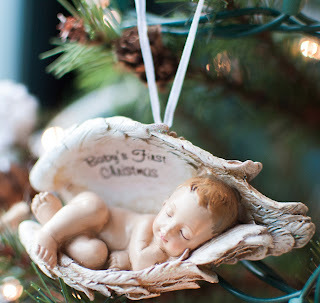 I really want to get a Willow Tree ornament, a glass etched ornament, an ultrasound ornament, and a footprint/handprint ornament. Their tree sits on top of Lily's memory chest in my room, right by the window, in between my bed and desk. 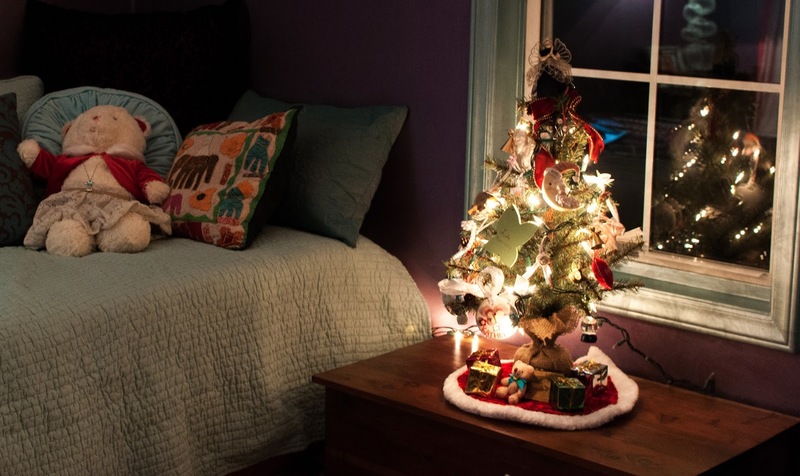 The tree has pinecones attached to it and I added white lights. 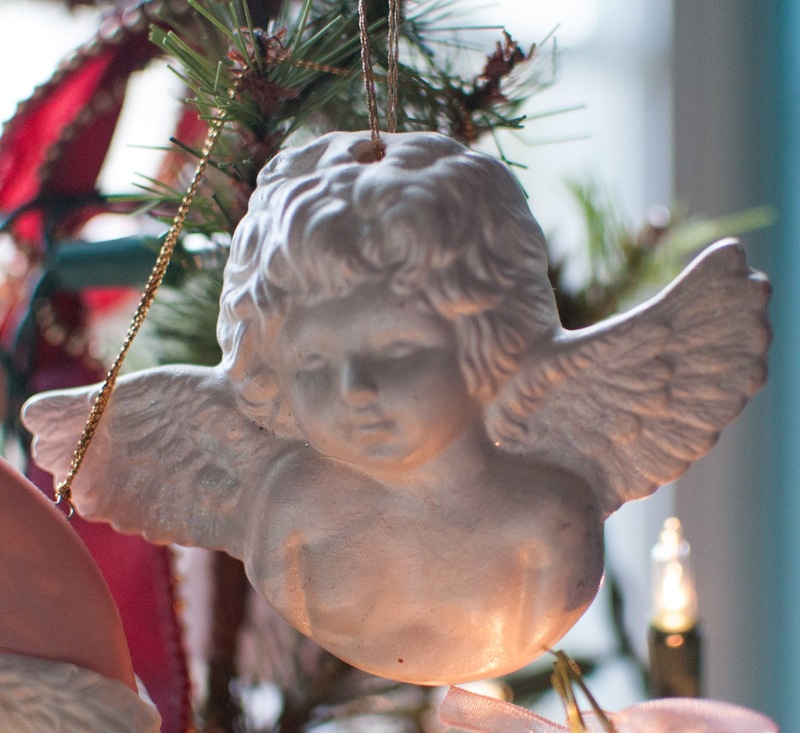 This is the little angel that sits on the top of the tree. 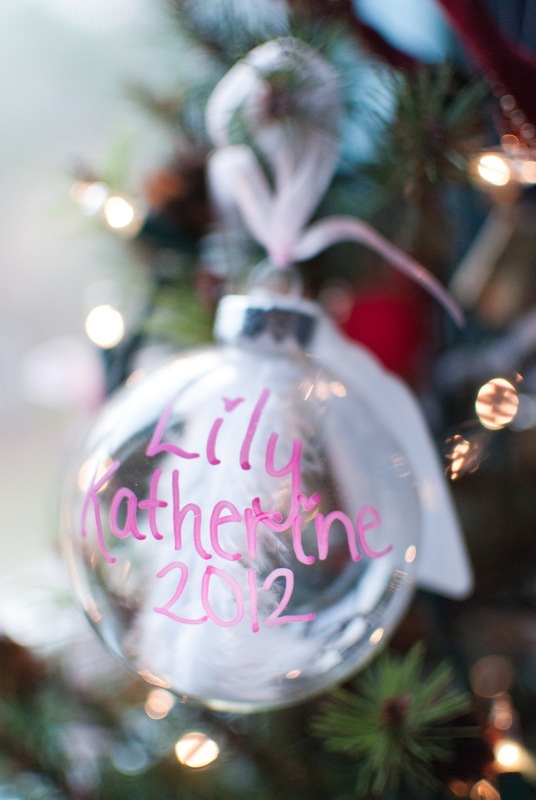 This little snowglobe ornament has Lily's name on it. 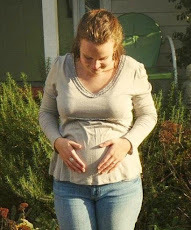 I got it in 2009, when I was pregnant with her. 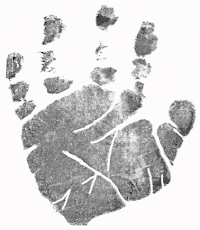 I got it at J.C. Penny one day when I was out shopping for her. It means a lot to me now because I got it when she was actually here with me. I also got this little snowman ornament for Lily when I was pregnant with her. 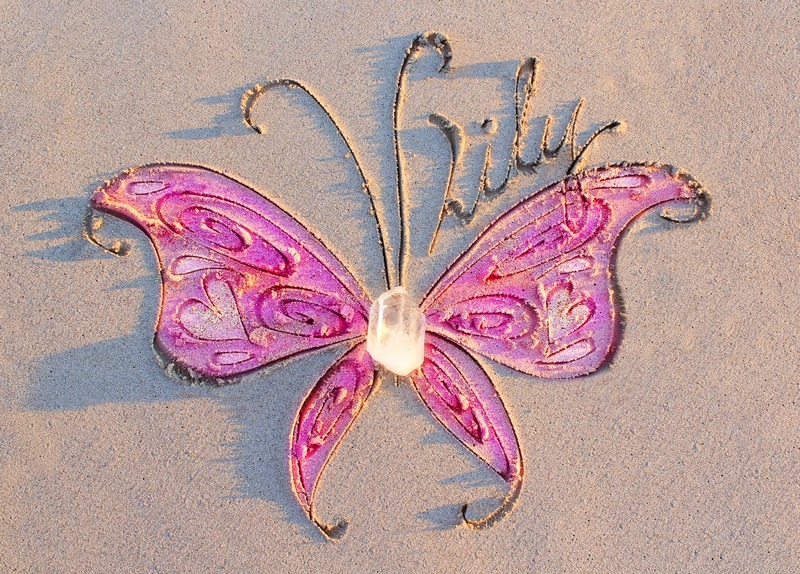 Again, it doesn't have much meaning behind it, but is special because it has her name and I got it when she was here. My sweet friend, Tracey, is in my local support group. She is so thoughtful and makes an ornament each Christmas in honor of each baby for everyone in group! 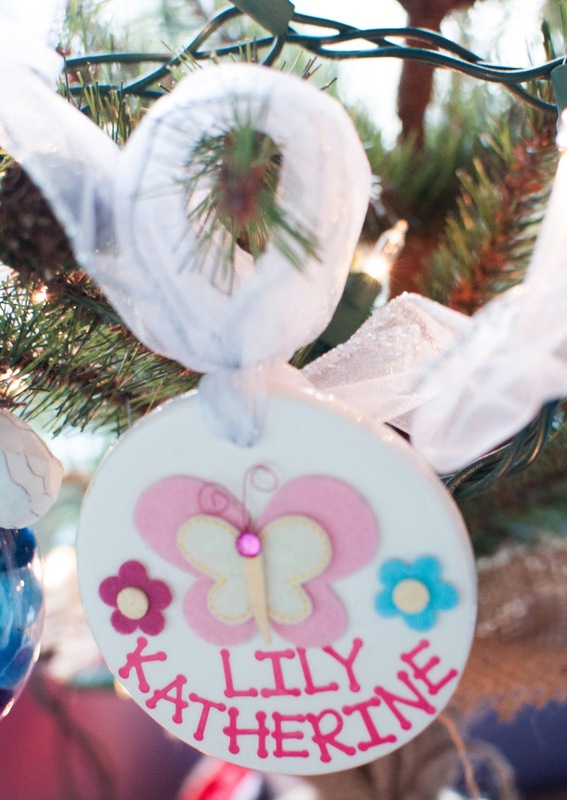 This is the ornament she made for me in honor of Lily in 2010. This is the ornament Tracey made for me in honor of Lily in 2011. This ornament was given to me by my friend, Brittany, this Christmas. We did an ornament exchange in honor of my Luke and her Lucy. 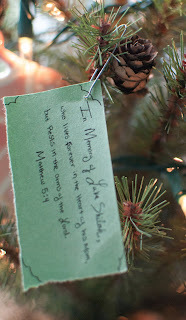 This is the little tag that she sent along with the ornament. This is the ornament I made for Luke this Christmas, similar to the one I made in honor of Lucy for Brittany. 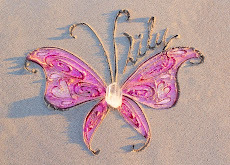 Butterflies remind me of him! 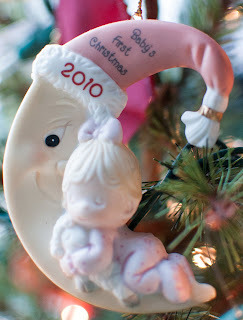 This "Baby's First Christmas" ornament is one I got for myself...I got it in honor of both my babies. Because really, they shared the same first Christmas. 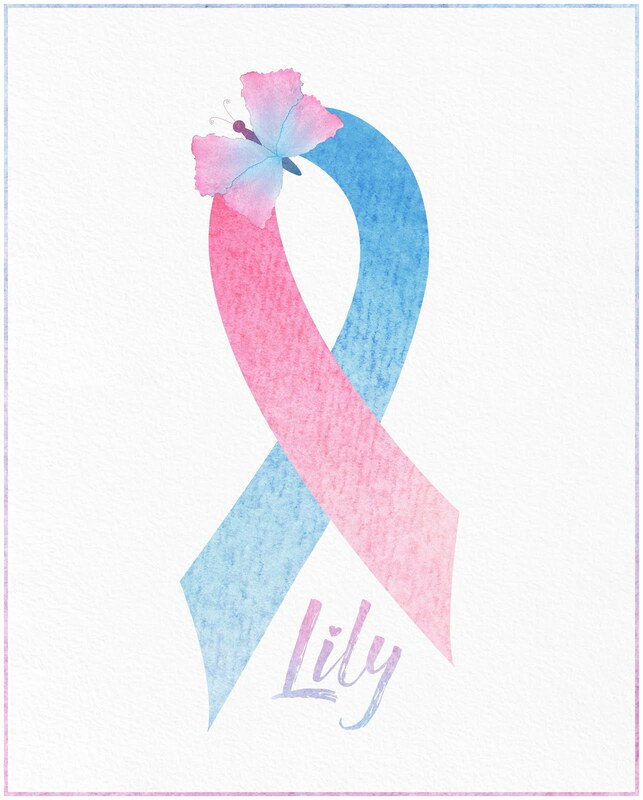 Luke's was in Heaven in 2009 and Lily's was in the womb in 2009. Now, they are both asleep to the world, but spend Christmas together with the Lord. This "Baby's First Christmas" ornament is Lily's. 2010 should have been the first year she was outside of the womb enjoying Christmas with her family. I love this one because lambs remind me of her, symbolizing innocence. 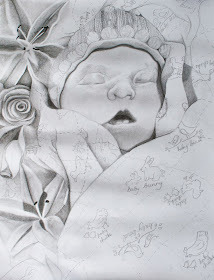 She is asleep to this world, but alive in Heaven. 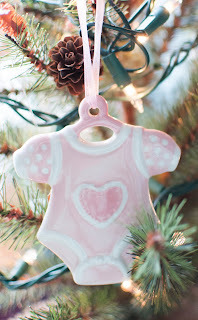 I won this baby girl onesie ornament from a blog giveaway that Kelly at Sufficient Grace Ministries hosted this year. 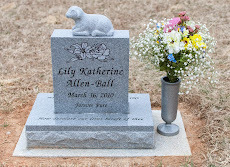 It has a space on the back to write Lily's name, birthdate, and weight. These are my pendants made by In Our Hearts Photo Pendants. I thought they were nice to hang on the tree. 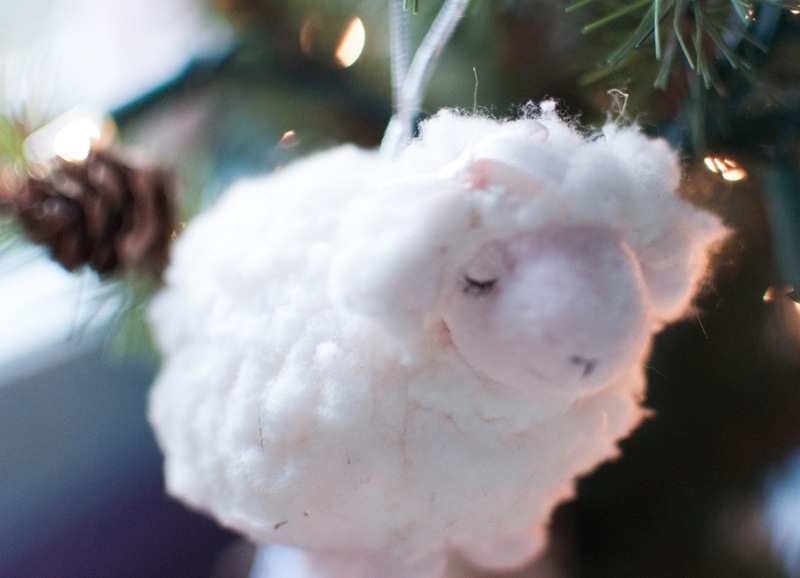 This little lamb ornament came with something that my mom and I got for Lily when I was pregnant with her. As I mentioned before, lambs remind me of her. 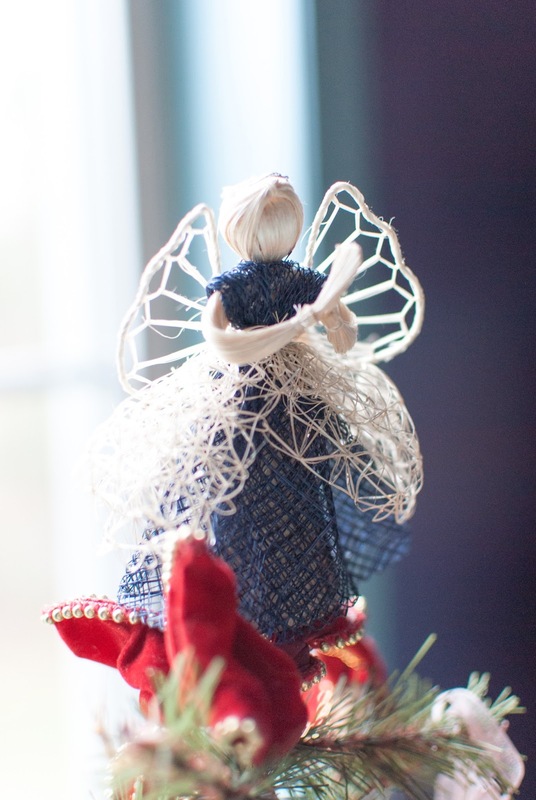 I got this angel ornament at an antique store in South Carolina a few days before Christmas this year. 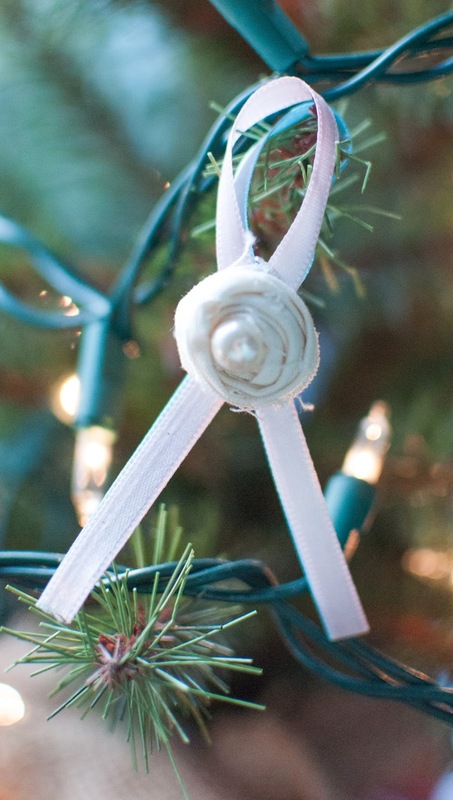 I think it's really beautiful and has a sweetness and innocence to it. And angels remind me of my babies because they are surrounded by angels! 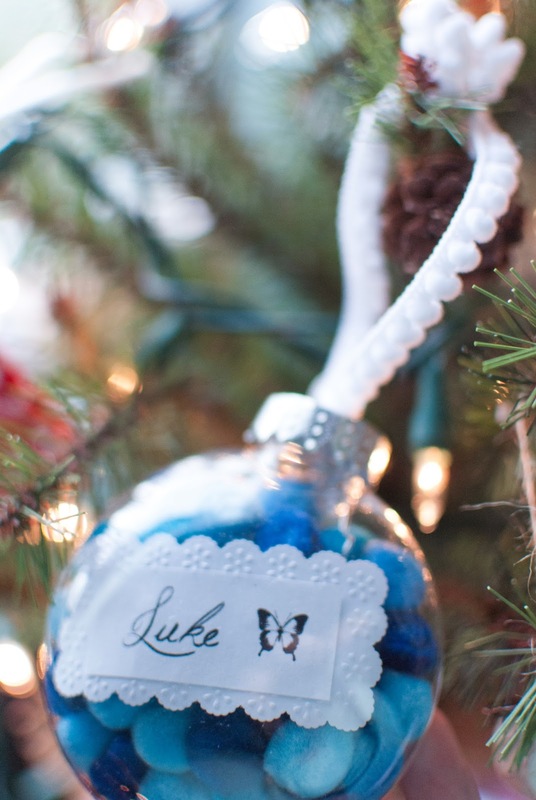 I got this ornament for Luke this Christmas because his middle name, Shiloh, means "Peace." I have a mini, red tree skirt. And little presents. 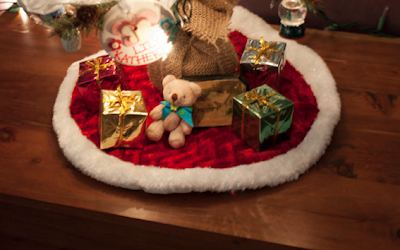 And there is Luke Bear under the tree, along with a winter scene painting. I hope everyone had such a wonderful Christmas celebrating the birth of our Saviour and a Happy New Year! I'd love for you to share photos of your baby's tree and/or ornaments! 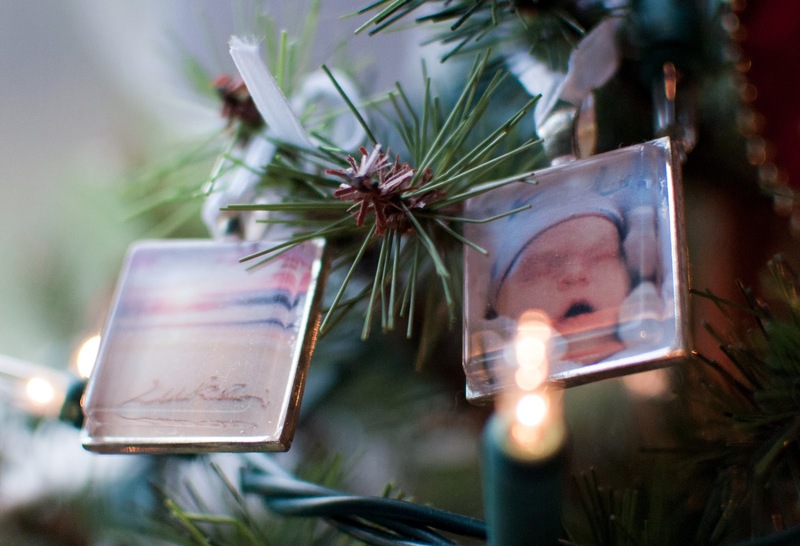 Where is an awesome place where you got an ornament in honor of your baby? 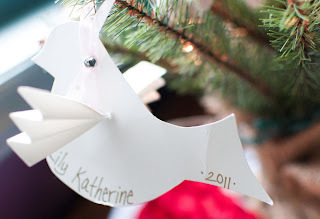 These are just some ideas, but there are lots more beautiful ornaments if you just look around...you never know, you may find the perfect one at a random little store somewhere! 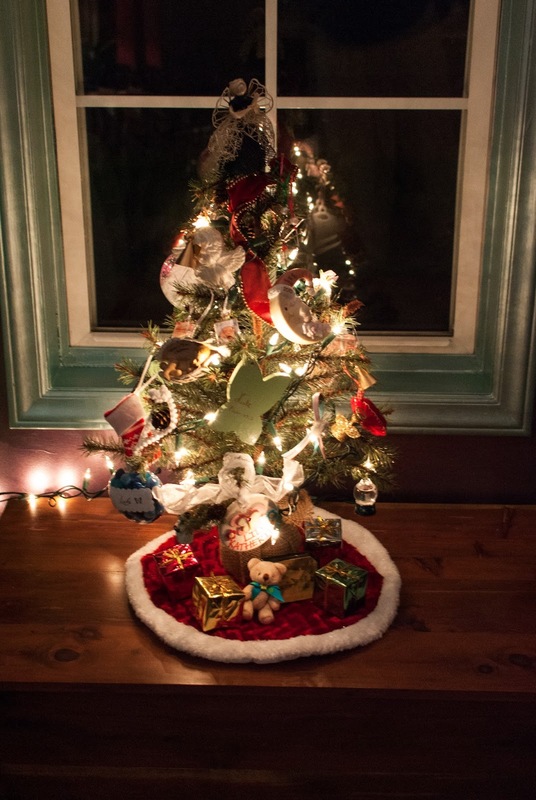 You can also get mini trees at all sorts of stores, like Michael's, Target, T.J. Maxx, etc. Gorgeous. Just GORGEOUS! I Love each ornament you have, so much meaning. 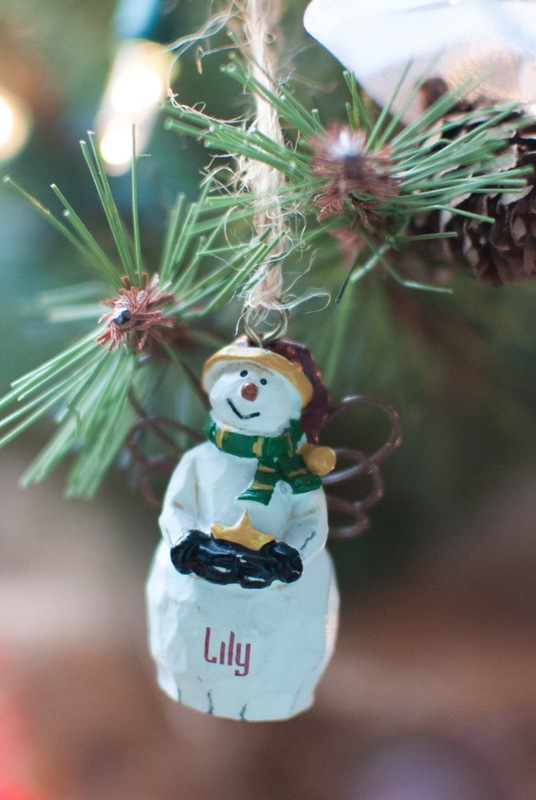 That is so sweet of the lady in your group to make everyone ornaments! 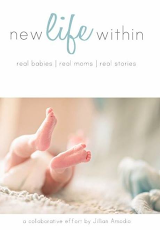 My favorite is the baby inside the wing. My Nana has a big version that is meant to sit on a shelf...It really gets to me. Such a sweet statue. 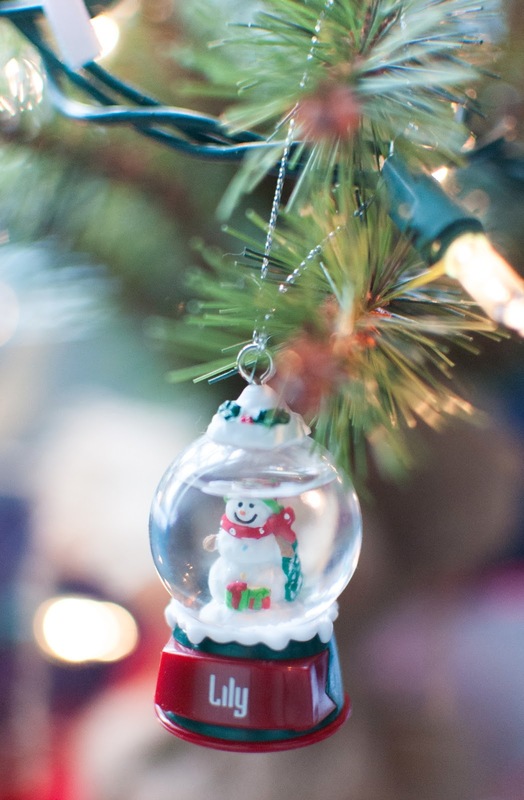 Ornaments plays a vital role in beauty of a Christmas tree, all of the shown ornaments are very beautiful, they are just stunning, I just love everyone of them.